Welcome to PanMan.com Cast Iron Cookware! Cast Iron Cookware featuring Griswold, Wagner, Favorite, Wapak, Sidney and Hollow Ware. Featuring Kettles ‘n Cookware newsletter. Pages of invaluable cast iron cookware information. 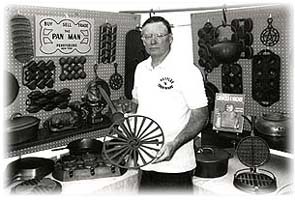 David G. Smith, well known as the “PanMan”, who resides in the western region of New York State, is both a collector and dealer of Cast Iron Cookware. He has been collecting for over thirty years during which time he has assembled one of the finest collections of Iron Muffin Pans and Broilers in the nation. Not content with only collecting early cookware, David Smith became keenly interested in the history of cast iron cookware and its manufacturers. He spent hundreds of hours researching creating a monthly news letter for over 10 years. In addition to collecting, he has been actively buying and selling iron cookware for over a decade. David Smith is the co-author of The Book of Griswold & Wagner and The Book of Wagner & Griswold. He was a contributing author to the authoritative kitchenware book, “300 Years of Kitchen Collectibles” by Linda Campbell Franklin, and has had articles published in various antique trade publications. The Book of Griswold & Wagner, referred to as the blue book by collectors is the most complete, accurate, and widely used reference and is coveted by collectors. It is now back in its 4th edition with even more pictures, updated values for cast iron cookware and kitchen collecting enthusiasts, and expanded charts. This definitive, encyclopedic guide details durable cast-iron antiques, including cornstick pans, griddles, Dutch ovens, gem pans, coffee grinders and roasters, trivets, molds, broilers, teapots, and much more. Nearly 1,000 photographs document variations of shape, size, dates, moldings, finishes, hardware types, catalog numbers, and markings. There are comprehensive histories of the manufacturers Griswold, Wagner, Sidney Hollow Ware, Favorite, and Wapak, as well as patent lists for meticulous researchers. This is an essential reference for anyone wishing to invest in these timeless treasures. The authors, two of the foremost experts in the field of cast iron cookware have combined more than 40 years of experience and knowledge to compile this definitive reference.Cast iron cookware has been necessary equipment for a well-stocked kitchen since it first became available through mass-production in the 19th century. These solid reminders of a bygone era-cornstick pans, griddles, Dutch ovens, gem pans, and teapots-can be displayed proudly and used everyday. With over 900 photographs documenting variations of shape, size, dates, moldings, finishes, hardware types, catalog numbers and markings, this book is much more than an encyclopedia : it is the definitive reference. This book contains comprehensive histories of the manufacturers Griswold, Wagner, Sidney Hollow Ware, Favorite, and Wapak, as well as patent lists for meticulous researchers. Things that dice, measure, filter or whir — if it belongs in the kitchen — collectors will find it in this guide to three centuries of domestic tools of trade. Offers healthy servings of classic recipes, helpful hints, and fascinating tidbits from 18th, 19th, and 20th century trade catalogs and advertisements. More than 7,000 antique items are arranged by function, from preparation and cooking to housekeeping and gardening, and then valued.